We can dispense with the more intimate nuances of battle here, for there were - essentially - none. This was a grind, hurling's equivalent of a pub arm-wrestle, nobody especially concerned if beer got splashed on any of the arty set who'd prefer an umbrella on their glass. And Limerick won, inevitably so given they're so much deeper into their physical and psychological evolution as a marquee team than Mattie Kenny's Dublin. The best sides follow Al Capone's Chicago rules. They whack you with a minimum of fuss, turning the lights out almost without you noticing. For fifty minutes, Dublin were under the illusion that they'd got the All-Ireland champions breathing heavily in Nowlan Park, only to leak an unanswered 1-5 during the next twelve and, well, thereafter the only voice in their heads had to sound suspiciously like Joe Pesci. True, they were just a goal adrift at the close, snaffling the last four points of the day, but it never came to feel like an escape might be on the cards. Limerick have wintered better than anyone had a right to expect and, whatever might await them in the coming months, nobody's going to be pushing them around any time soon. For John Kiely, then, aesthetic considerations were always secondary here. He said as much afterwards, describing the game as one largely bereft of rhythm and, accordingly, an occasion to survive as distinct from decorate. "The good, the bad and the indifferent I suppose," he shrugged in the old dressing-room tunnel. "When Dublin went with a sweeper, that was obviously going to change the nature of the game and it did have an impact on the first-half. I think we coped with it very well, we were precise and measured in what we were doing with the ball. I think we were solid. "But, at the same time, it took us a long period of time to wear down the game to get to a point where we could push on." 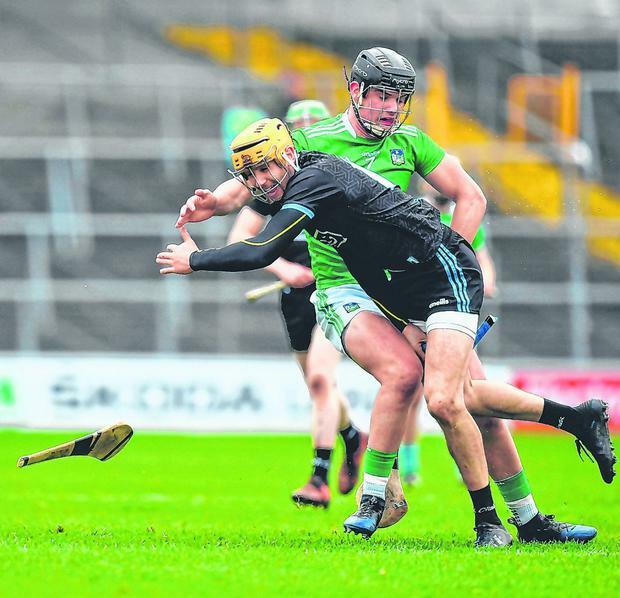 Sean Moran was deployed as the supplementary body to protect Dublin's full-back line while Tom Condon took the role of Limerick's 'spare' defender. It meant a quiet day for the respective goalkeepers, the game essentially settling into a tactical stalemate played out in the middle third. That might have been a triumph of sorts for Kenny, but Dublin weren't helped by the loss of Oisin O'Rorke, Sean Treacy and Riain McBride - all to badly rolled ankles - inside the opening 25 minutes. They also lost Daire Gray to a lengthy blood substitution, Kenny conceding "the injuries kind of stopped us building momentum in the first-half". That they undoubtedly did, albeit Danny Sutcliffe and Eamon Dillon always looked to have the beating of their markers when ball was put in front of them. They'd both scored 0-2 each inside the opening 12 minutes but, therafter, the quality and quantity of ball coming their way dwindled to a trickle. Graeme Mulcahy was firing equally well at the town-end, but the only murmur of a goal would come deep in first-half injury-time when Kyle Hayes went knifing through Dublin's defensive spine, off-loading to Aaron Gillane who instantly put his hands to his head after a swivelling shot that flew over Alan Nolan's crossbar. That gave Limerick a 0-10 to 0-9 advantage and, with the wind to come, Kiely's men already looked well set to make the final. Kenny described them after as "probably the most physical side in the championship at the moment", stressing that the description wasn't intended as anything but a compliment. 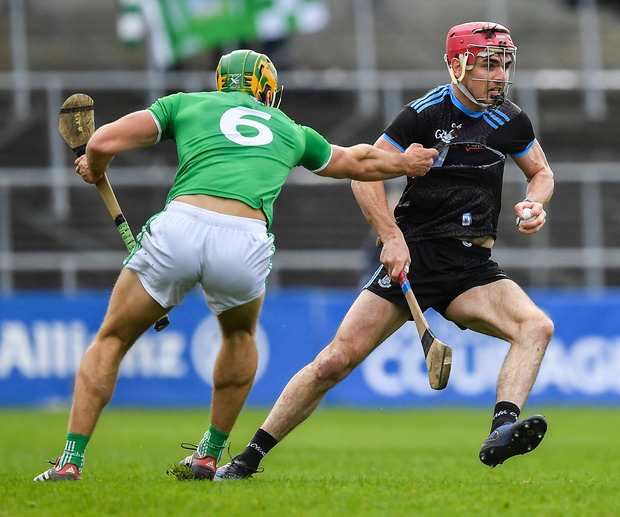 And that physicality slowly, inexorably became just too much for Dublin, especially in aerial combat, the likes of Diarmaid Byrnes and Dan Morrissey relishing the sight of anything being driven long. The instruction to Kenny's players was an audibly unambiguous "catch and carry" now, but Limerick simply were not of a mind to play doorman. With just over a quarter of an hour remaining, they brought on Seamus Flanagan, positioning him on the edge of the 'square' and, instantly, seemed to have a new appetite for dropping shells towards Nolan's 'square'. One such shell, from Byrnes, came dropping a little short in the 61st minute only for Cian Lynch to improvise wonderfully, catching the ball almost behind his back, then flicking a delightful pass into the path of the in-rushing Flanagan, whose finish was emphatic. 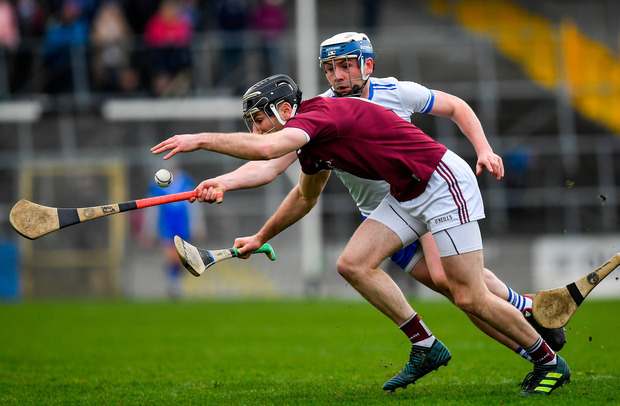 Byrnes soon added a monster point from his own half and, leading now by nine with as many minutes remaining, the possibility loomed of Limerick cantering away to an emphatic win. But substitute Ronan Hayes then batted a cleverly-taken goal past Nicky Quaid and, somehow, Dublin were - technically at least - back in a contest that had looked out of their reach. They kept coming too, Paul Ryan (a free), David Treacy, Sean Moran (a free) and Chris Crummey all striking late points as Limerick seemingly ran out of ideas or - maybe - interest. As Kiely, now targeting a first League title for the county since '97, saw it: "Some days you just have to grind it out and today, for me, was one of those days. Just get the job done and get out." For Kenny, the game was - as he put it - largely educational. "We learned a lot again today, and that's what we're here for," he declared. SCORERS - Limerick: A Gillane (3f), D Byrnes (4f) 0-5 each, G Mulcahy 0-3, S Flanagan 1-0, D O'Donovan 0-2, C Lynch, G Hegarty, T Morrissey, P Casey 0-1 each. Dublin: P Ryan 0-6f, D Sutcliffe, E Dillon 0-3 each, R Hayes 1-0, T Connolly, S Moran (f), C Crummey, D Treacy 0-1 each. LIMERICK - N Quaid 7, T Condon 7, S Finn 8, R English 7, D Byrnes 8, D Morrissey 7, P O'Loughlin 7, C Lynch 7, D O'Donovan 7, T Morrissey 7, K Hayes 6, G Hegarty 6, G Mulcahy 8, P Casey 7, A Gillane 7. Subs: D Dempsey 7 for T Morrissey (52), S Flanagan 7 for Mulcahy (54), C Boylan 6 for Hegarty (59), M Casey for Condon (65), B Murphy for Hayes (66). DUBLIN - A Nolan 7, P Smyth 7, D O'Connell 8, E O'Donnell 8, S Moran 8, C Crummey 7, S Barrett 7, D Gray 7, R McBride 6, S Treacy 6, C Boland 6, E Dillon 7, D Sutcliffe 7, J Hetherton 6, O O'Rorke 6. Subs: P Ryan 6 for O'Rorke (11), F Whiteley 7 for Treacy (21), J Malone 6 for McBride (25), R Hayes 7 for Hetherton (43), D Treacy 6 for Boland (51), T Connolly for Gray (blood sub, 18-35). Referee - J Keenan (Wicklow).